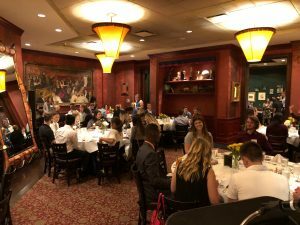 The Greater Oak Brook Chamber of Commerce presented its first Greater Oak Brook Intern Day Luncheon honoring 75 college interns working with member employers in Oak Brook and Oak Brook Terrace this summer. The event, coinciding with National Intern Day, was held on July 26 at The Clubhouse in Oak Brook from 11:30 a.m. to 1:30 p.m. Interns from member companies including Ace Hardware, ComEd, Elkay Manufacturing, HUB Group, Millennium Trust Company, Inland Real Estate, Hyatt Lodge and Child’s Voice attended the event. The luncheon’s program shared information with local interns regarding the benefits of choosing the Greater Oak Brook area when they consider the launch of their own careers. Each table was be hosted by a member of the Chamber’s Young Business Leaders group, offering perspective on their own career development working within the Greater Oak Brook community. The interns had the opportunity to benefit from a panel discussion of experienced hiring managers, sharing insider recommendations on making the most of internship opportunities and standing out in the graduate hiring process. 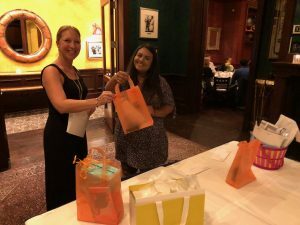 The interns were also be entered into a raffle to win generous prizes from area retailers, hospitality and wellness providers including Michael Jordan’s Restaurant, Kendra Scott, Vineyard Vines, Pandora Jewelry, Roka Akor, Alex and Ani, Waxing the City, West Suburban Wellness, Oakbrook Center, Hyatt Lodge, Marriott Oak Brook, Top Golf and others. Chamber staff member Jenny Stanko presents a raffle prize. Internships are seen as one of the most effective tools employers have in developing their pipeline of future talent. According to the National Association of College and Employers 2018 Internship and Coop Report, intern offers and acceptance rates indicate a robust hiring market. U.S. employers expect to hire 3.4% more interns in 2018 than last year. The 2017 offer rate for interns was 59%, the acceptance rate was 77.3%, and the conversion rate was 45.6%, demonstrating the great value for interns and employers in participating in this process.